Snrky: I left the razor in your desk drawer. I left the razor in your desk drawer. That's right. 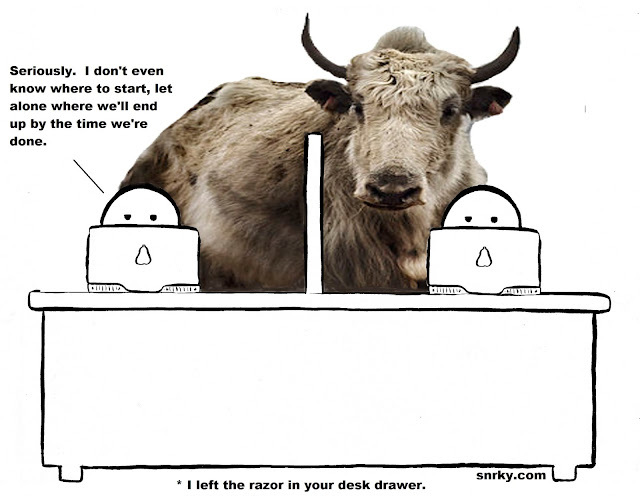 There was a shaving the yak reference last Thursday! That's the fun part of having two authors and not sharing details before publishing. Things end up being a surprise and we can riff on each other and even try a few punchlines with one comic. More than anything, working on this version tells me I need to get much better at using GIMP. My co-author's link to Joi Ito's Yak Shaving article struck a nerve, because I'm guilty of this in one of the core behaviors I engage in, cleaning. My wife has been annoyed in the past because when I clean, I tend to focus on clutter, and I'll just go, go, go, moving one section of the mess to another place, then removing, removing, removing, chasing the pile as it hops from place to place. And if there's painting to be done, or dusting, or scrubbing, I ignore it. It's a separate issue. Why? Because those are subroutines I can cut out of my main method, which was to clean space x, minimizing the scope of the function, or reducing the recursion. And I'd rather get full coverage of the routine I'm working on, than partial coverage of a number of routines, or routines where the duration doesn't suit my requirements. Interestingly, the garage seems to be a Utility Method in my system, as things migrate from all over the house to a table in the garage, and from there out of the house completely, to recycling, trash, or a charity. The garage generally represents the second to last routine I call in all cases, so in some respect I've separated it from the other cleaning and it's not necessary to finalize the last step to consider the main job done. Unfortunately, it acts sort of like a database and now and then I have to engage in a bit of index optimization and orphan removal so that there's storage space available for more operations. I could add more storage, but my company doesn't have a sufficient budget. As Ito says: "They talk about many hackers spending a lot of their time "lost in life's subroutines" and that "some of us like solving puzzles a bit more than we like solved puzzles." They suggest that super-efficient hackers "learn when to say no to the temptation of endless fiddling." Veeeery interesting. So this is what I've been doing all my life. Shaving Yaks." Snarky: Seriously. I don't even known where to start, let alone where we'll end up by the time we're done. Title: I left the razor in your desk drawer. Yak courtesy of Creative Commons Attribution-Share Alike Generic 2.0 license. English: Yak (Bos grunniens) at Letdar on the Annapurna Circuit in the Annapurna mountain range of central Nepal. 3 April 2012. Flickr. Author: TravelWayOfLife.